My friends Heather and Alex live on a boat. They have recently moved said boat from a 1,000 berth marina in Brighton to a tiny little enclave just outside Bristol. The setting is pretty idyllic: lines of squat houseboats with names like Katie-Jayne, with terracotta pots full of plants balanced on top. Last weekend was the boat launching party. It’s been out of the water for the last few months, being given an odd sort of TLC that involves its underside being shot-blasted. It has also been given a coat of paint, and now sticks out from its more demure neighbours with its bright shades of green and yellow. It was one of those perfect summer days that you call up the memory of in the depths of the English winters: sunny, clear and with a gentle breeze. It was also, conveniently, the summer solstice – the longest day. We were sat on the deck of the boat until at least midnight, and there was still a glimmer of light in the sky. We had a barbeque, the sure-fire sign that summer has started. There is a large, Australia-style communal barbeque at the marina. There’s something intensely primal about cooking and eating outside, and watching meat hiss and spit as it cooks over a flame. I made these mini pavlovas to follow the vast quantites of barbequed meat. I wanted to make something that was creamy and summery, but could be eaten without the need for plates or cutlery. 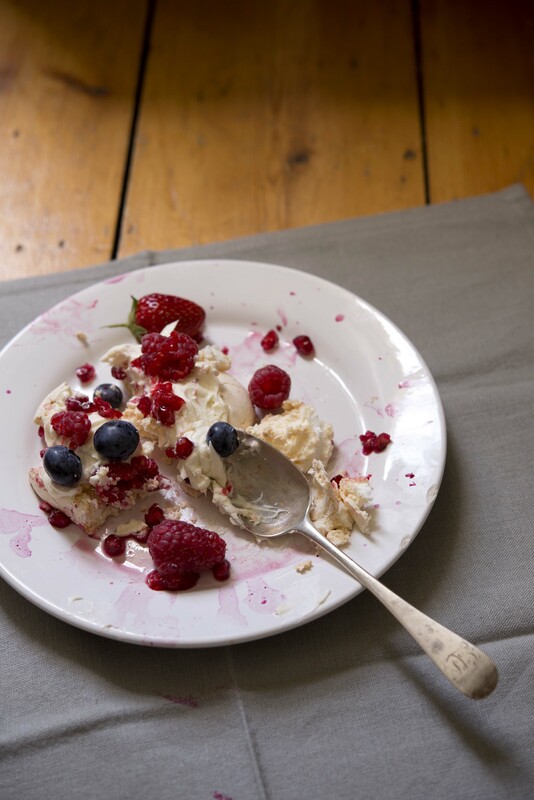 The meringue acts as a little bowl for the marscapone filling and summer berries. I used raspberries, blueberries and some strawberries that I managed to salvage before they went into the Pimm’s. I also added pomegranate seeds, more for artistic frippery than taste, but they were actually surprisingly pleasant. First, make the meringues. Preheat the oven to 120C. Line 3 baking trays with baking paper. 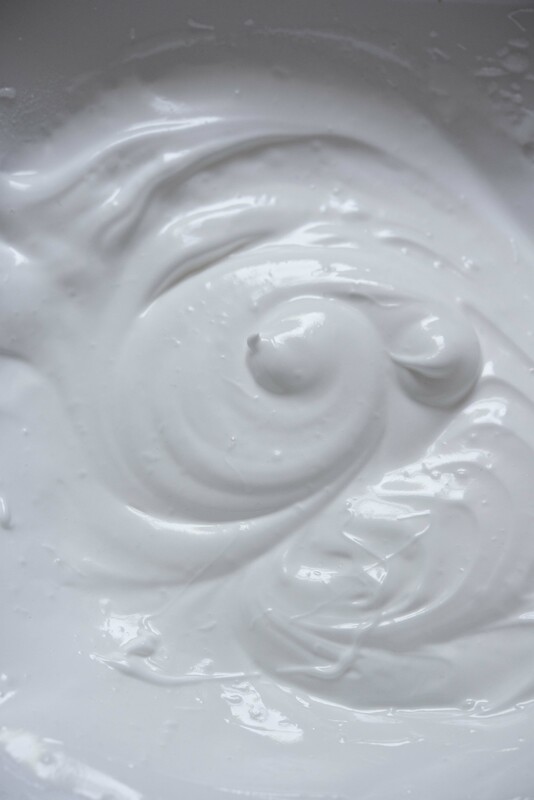 In a clean bowl, whisk the egg whites until they form soft peaks, then whisk in the caster sugar gradually. Continue whisking for a further couple of minutes, until you have a stiff, shiny mixture. Dollop tablespoonfuls of the mixture out onto the baking trays, and use the spoon to shape the mixture into rough circles about 6cm in diameter. Push the back of the spoon into the middle so it makes a dip for the filling. Bake in the preheated oven for 30-40 minutes, until the meringues are dry and starting to firm up. 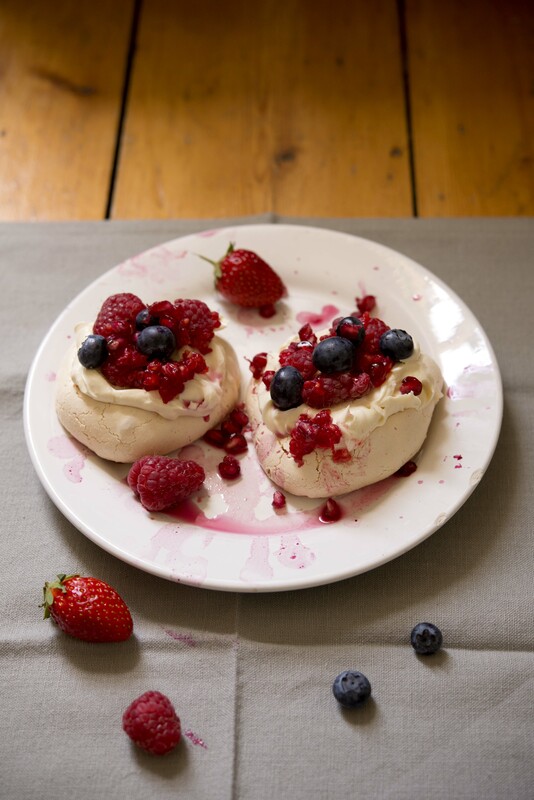 Turn the oven off, but leave the meringues in the oven until they are completely cool (this helps them to go squidgy in the middle, apparently). 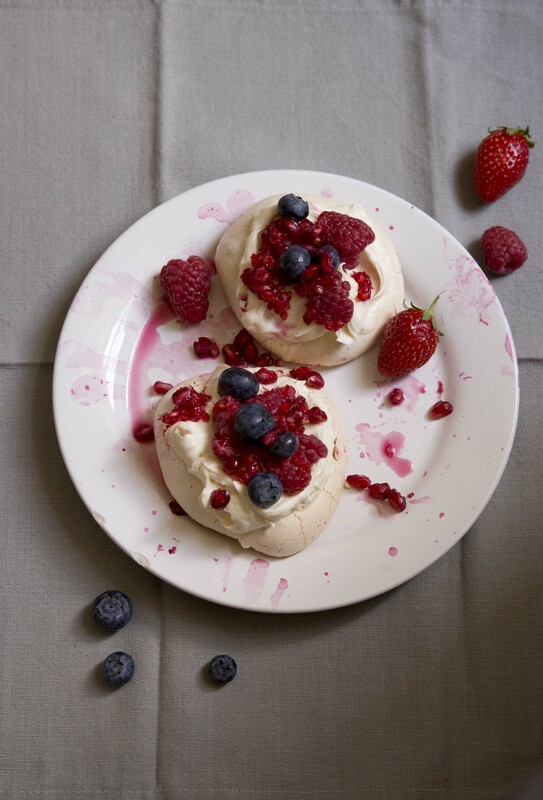 This entry was posted in Baking, Party, Puddings, Summer and tagged blueberries, mascarpone, meringue, party, pavlova, pomegranate seeds, raspberries, strawberries, summer. Bookmark the permalink.